I crash with this mod however you said that I may have to update my java so I'm going to try that. Although I did watch a mod showcase on this mod and this mod seems REALLY good! I may want to use it for my COD deathmatch I'm gonna be doing with my friends and record it. I just need your permission. Anyways nice job with the mod! Could you please tell me if it needs forge or anything else for it to work? I'm using Not Enough Items mod but it Minecraft doesn't want to start up. After I hit play in the launcher, nothing happens. I have a crash report It's something to do with shooting entities. OpenGL: AMD Radeon 6600M and 6700M Series GL version 4.3.12618 Compatibility Profile Context 13.251.0.0, ATI Technologies Inc. I have the same issue. 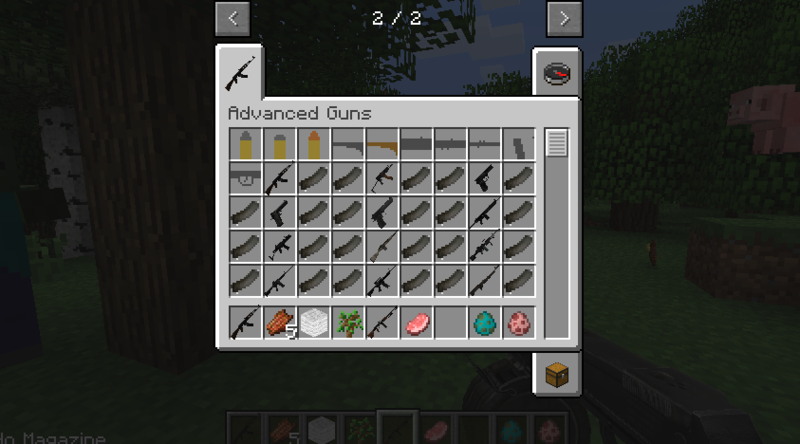 I loaded this mod with a couple others like NEI and Optifine and when I tried shooting a zombie it crashed. plz fix. I just compiled a small update that should patch the error and hopefully give me more insight into what is causing it. If there continues to be interest in this mod I may update it to the newest Minecraft version! Also, If you have an issue post your own stack trace in a spoiler please. Saying "when i run it is carshis" does not help me at all. Again, this is in the WIP section and is an alpha release so bugs should be expected. I'll possibly do a mod showcase later in the mod's developement. It currently is the guns from COD4 minus the sniper rifles and I want to stick with normal guns; not crazy guns/exosuits/zombies and stuff. The mod was designed for competitive multiplayer use. Shots are accurate and the guns are balanced. Location: In my secret layer. Ey I'm very decent with gun anims on blender, maybe I can help you. These logos would not have been possible without cool text. create your logo for free with cooltext.com! More information about cool text is on the website cooltext.com. There is a glitch were you cant look down the sight but only zoom in on every weapon,and were are all the guns?there is only the rpd,scorpion,the pistol,and the other smg. Could I have useful information on this glitch? Not sure what you are talking about with missing guns. If it's from COD4 guns I suggest you call it "Call of Duty Guns Mod" instead of "Advanced Warfare"
Thanks for the suggestion! Maybe that can help it get more attention! I Would Love Too! But I Am Requesting For This Mod In 1.7.10? Anyway, I Am Making A Minecraft Call of Duty Advanced Warfare ModPack, And I Am Wondering If I Can Use Your Mod. Also, I Installed This On My Friends Computer Running Windows, But I Installed It On My Mac, And It Doesn't Work? I Am On 1.6.4 Forge, And I Installed The Power Suits Mod On 1.6.4, So Please Make It Compatible With Mac Please! This mod keeps crashing me when i install the mod. Like i start minercraft and it crashes it doesnt reach the mojang page. What did I do wrong PLZ help me. I am going to need a stack trace to be able to help you at all. I do not have a Mac and cannot test it with one. Again, I need a stack trace. Stating that the mod crashed does not help me figure out your problem at all as it runs perfectly fine on my computer. None of the sounds were taken from that mod. The sounds, models, and weapon balancing has been taken directly from COD4 (except for the M4A1). If flan's mod also uses the sounds from COD4, then that is why they match up.